I grew up spending the holidays with a family that goes way overboard on Christmas, my house used to look like Santa’s workshop every year, and everyone was moved by the contagious Christmas spirit. It was always a special time for me. But after spending my first Christmas in Sweden, I was introduced to a lot of new exciting traditions that reminded me how awesome is this time of the year. If you wanted another reason to visit Sweden, well, I’m about to give you six more in my ultimate guide to Swedish Christmas traditions! This is the beginning of Christmas and it starts on the first Sunday of December. What you do is that you get an Advent Candle, it’s a candlestick that has four candles, and the tradition says you should light one candle on the first Sunday, then two candles on the second Sunday, then three, and then four. By the time they are all lit, Christmas should be a couple days away, if it’s not Christmas that day. In Sweden, the Advent is celebrated in a slightly different way, what happens is that people use the Advent Candles but they have some electric ones instead of the traditional candles and they put these by the windows so when you’re walking down the streets you see all the windows with the candles and it looks beautiful But on top of that they put something else. They have these lamps shaped like stars and they put it by the Advent Candles, so from the streets, you see a lot of stars suddenly appear and it’s a magical sight. This is one of the things that kicks-starts the holidays, and when you see this, it really feels like Christmas is here. The celebration of Saint Lucy’s day or Santa Lucia is one of the most beloved events in Swedish Christmas. For a long time, the 13th of December was known as the longest night of the year. In Scandinavia, that’s a big deal because the light is a little scarce in the winter. That’s why the celebration of Lucia and fencing off this long night came together to create a unique celebration in Sweden. How is Lucia Celebrated in Sweden? One girl is selected to play Lucia, and this girl will be dressed in a special outfit. A white robe, a crown made out of electric candles, and a red sash to use as a belt. Originally it was done with real candles, but you will usually see the electric ones, which are a less dangerous alternative. Lucia will walk into the room where the celebration is being held, while everyone’s just anxiously waiting inside. The doors will open and Lucia enters the room, but she’s not alone. Accompanying her are the handmaids, who are wearing the same white robe but they are only holding one candle. Also, we have the Star Boys who have these hats and the stars, and of course, we have the Tomtenissar which are Santa’s Helpers. Once the entrance is completed that’s when the songs will start. Everyone in Sweden knows those songs by heart and anyone can sing it, in or out of tune, it doesn’t matter as long as you participate in the celebration of Lucia And Lucia. Like any good Holiday, has its own food. So you will be trying some gingersnaps, saffron flavored buns and glögg. This last one is a traditional Swedish wine that you must warm up before drinking. Once warm you add almonds to it (In the video I mentioned you should add peanuts, scratch that! Don’t add peanuts please!). If you find yourself in Sweden on December 13th, remember to join the Lucia celebrations, try to keep up with the songs and enjoy the good food. Julbord is another great Christmas tradition in Sweden, and it comes from the words “Jul” which is Christmas and “Bord” that means table. 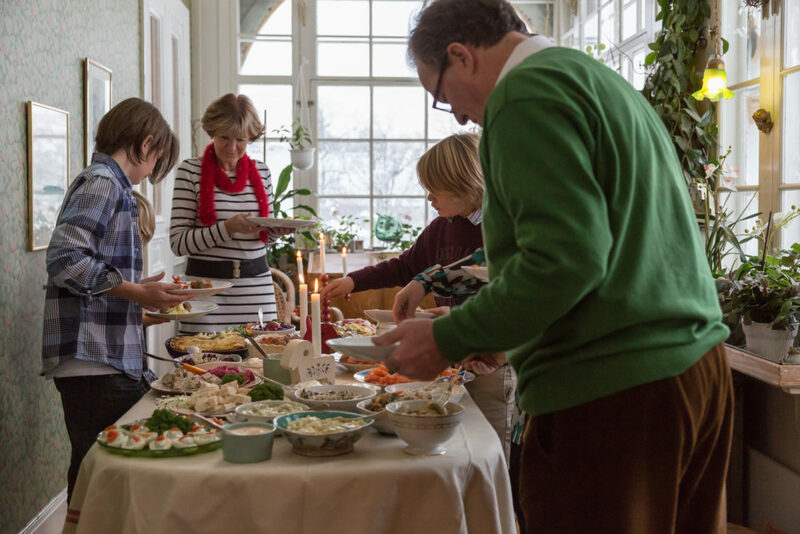 This is the classic Christmas dinner in Sweden and it has evolved through centuries. Julbord consists of a buffet styled dinner with over a dozen dishes to chose from but mainly consists of three courses. The food you’ll find in them has deep roots in Swedish history, some of the dishes come from the tradition that in Sweden you would fast from the Advent to Christmas, which means no meat. For that reason, they had to develop other dishes, which include certain types of fish you have for this event along with other creative culinary creations you’ll only find in Sweden. The Christmas Ham is one of the most important things on the table because centuries ago, this was the only time of the year when you could have it fresh. The difference is that now it’s presented as a sliced ham but it used to be cooked as a broth. During the day, people were so eager to finally eat some meat that they could barely wait until the dinner, but the temptation was such that some found a way to bypass the “No meat until the dinner” rule. The only way in which people could break this rule was that you could take a piece of bread and dip it in the broth, and this was allowed. So a lot of people used to do it and that became a tradition. It’s called the “Dopp i Grytan” and now it is a full dish you can find on a Julbord. And these are just some of the dishes that you will find on a Julbord. There’s so much more than you will see in there. Even late additions like potatoes play a big role in the Julbord There are a lot of dishes that contain them because now it’s just part of the Swedish culture. So if you’re spending Christmas in Sweden don’t miss the chance to go to a Julbord Go with classmates, with friends and you will have an amazing experience. And appreciate all the things that you have on that table. It’s gonna be delicious, I promise that. Julmust is the Christmas soft drink in Sweden, the name comes from the words “Jul” that is Christmas and “Must” that is a non-fermented juice from a berry or fruit. The thing is that people wait for the whole year for this because you can only get Julmust on Christmas. Well, you can get it on Easter as well, it goes by a different name but it’s the same drink, but when it comes to sales there’s a huge difference. 75% of it is sold on Christmas and only 25% on Easter, and it has a big impact on the other drink on Christmas. For example, the Coca-Cola Company had a tough time with Julmust, because for years their sales would go down to 50% or less because Julmust is the most beloved thing for Christmas. people love it. So if you find yourself in Sweden in December, you have to try Julmust, so go buy one in the grocery store. Christmas on the 24th: The first thing you should know about is that Christmas in here is celebrated on Christmas Eve, not on Christmas day. So, the 24th of December is Christmas in Sweden. This means that everything happens on this day. You meet your family, have your presents, enjoy a Christmas dinner and Santa comes to your house during the day, not at midnight or in the Christmas morning (on the 25th) as it happens in other countries. Julklapp: This is the Swedish word for Christmas present, the word comes from “Jul”, meaning Christmas and “Klapp” that means knock or tap. So why Christmas knock? The reason can be traced back generations ago. The old tradition was that you would bring your present to your neighbors, and you would knock on the door, you would leave the present, and then you would escape the scene. They would open the door and find a present, and that’s why it’s Christmas knock or the Christmas tap. So remember the Julklapp and bring the presents for the Christmas celebration. Rice Porridge for Santa: The Christmas rice pudding is a dessert, a very important one during Christmas. This is the one you leave out for Santa. So instead of leaving cookies and milk for Santa, you would leave rice pudding. It comes with a sweet red sauce, it’s a delicious treat for both kids and adults, as well as Santa’s favorite. Swedish Santa: Now let’s talk about Santa, the original Santa in Sweden is called Tomten and is not like the big Santa that you know. This guy is more like a small gnome, and he would go to your house and leave presents all over it. Kids would then go and find them all over their home. The image of Santa has changed now, with a more conventional Santa, wearing the well known red outfit and sporting the iconic beard and hat. You can still find the image of this old Santa in vintage postcards and illustrations, it’s a great part of classic Swedish Christmas. Santa’s Presents: Since we’re on the topic of Santa, let’s talk about the presents. Santa will go to the house and deliver the presents himself. It’s not one of those magical things where just Santa passes by, you don’t see him and the presents magically appear. Not at all, this time he walks into the house delivers the presents and walks out of the house. So there’s someone in the family on Santa duty and this person has a particular code that lets everybody know that Santa is coming. The code is “I’m going out to buy the newspaper” When the family members hear this they know it’s time for Santa to appear. That person will walk out of the house and then Santa will come. Kids get to see Santa, they receive the presents, Santa stays for a bit and then Santa walks back out. And the person who went out to buy the newspaper, comes back in, missed the whole thing, what a shame, right? These are just a few of the traditions that happen on Christmas Eve, it’s a really nice day to spend with the family. 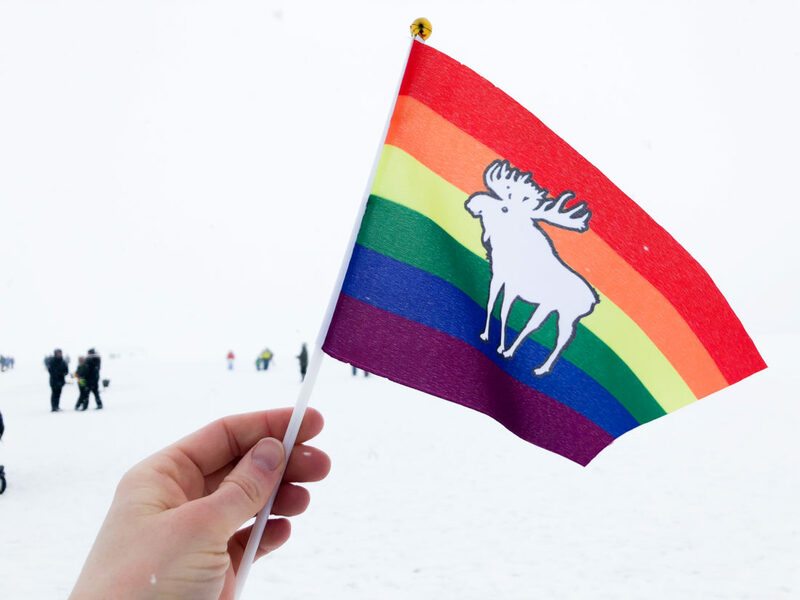 So if you’re in Sweden, try to join one of these celebrations. This is by far the most awesome thing at Christmas. This is my favorite, my number one, nothing beats this. So when I got here I asked all my classmates “What do you do on Christmas day?” And they all told me all about their traditions, but among these, they all had one thing in common. If you ask any Swede what do you do on Christmas Eve at 3:00pm, they will tell you the same thing You sit down and Watch Donald Duck. That’s right, Donald Duck, Why? I have no idea but this is a tradition in here, the world stops for Donald Duck in here. Everyone stops what they’re doing, they get together, they turn on the TV, and they will watch Donald Duck for one hour. This tradition comes from a few generations ago when Christmas day was the only day when you could watch cartoons on TV for one full hour. I mean, I like Donald Duck as much as the next guy but this thing is awesome the love that they have for this. Donald Duck is Christmas and all the cartoons that they have on it. They just sit down and watch some old Christmas cartoons and I think that’s awesome and I can’t wait to do it myself. So remember, if you’re spending Christmas in Sweden. Donald Duck, 3:00pm on TV. Stop whatever you’re doing and watch this with all your friends. Thank you for reading! I hope this will give you all the details you need to know to prepare yourself for your next Christmas in Sweden. 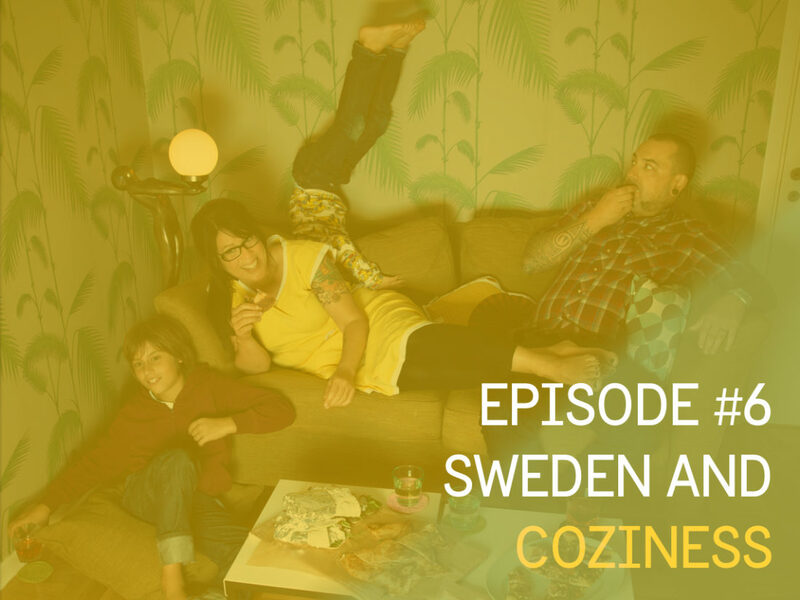 Stay tuned for the next posts about Swedish culture. What’s your favorite Holiday tradition? Let us know in the comments! How to survive winter in Sweden? Hola! I’m a graphic designer, video producer and expert shower singer from Colombia. I’ve spent most of my life creating content for every channel available and I’m totally passionate about audiovisual production, digital and interactive media. This passion is what brought me to Sweden, one of the biggest hubs for creatives in the world, and now I’m a student of the Interaction Design Master’s program at Malmö University. I’m very excited to be here, but the most amazing part is that this is my first time in Europe, and that means I have encountered new things every single day, and I wanna share as much as possible with all of you. I can’t wait to start sharing my experiences with you, stay tuned! Why did we choose Sweden?